Portfolio for Jira lets you view your team's work in your Jira application with the big picture in mind, so that you can efficiently plan work that can span multiple projects and involve multiple teams. As such, it's important to understand the concepts of hierarchy levels and initiatives. Epics – These are the products of higher-level priorities being broken down into smaller and more manageable chunks of work. 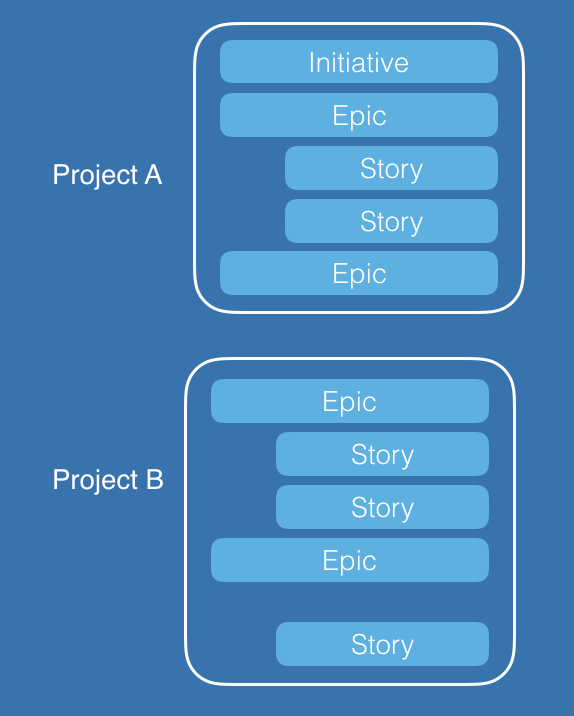 Epics can span multiple sprints in a Jira project, and are comprised of multiple stories. Stories – At the bottom of the hierarchy level are user stories, which typically capture functionality requirements. 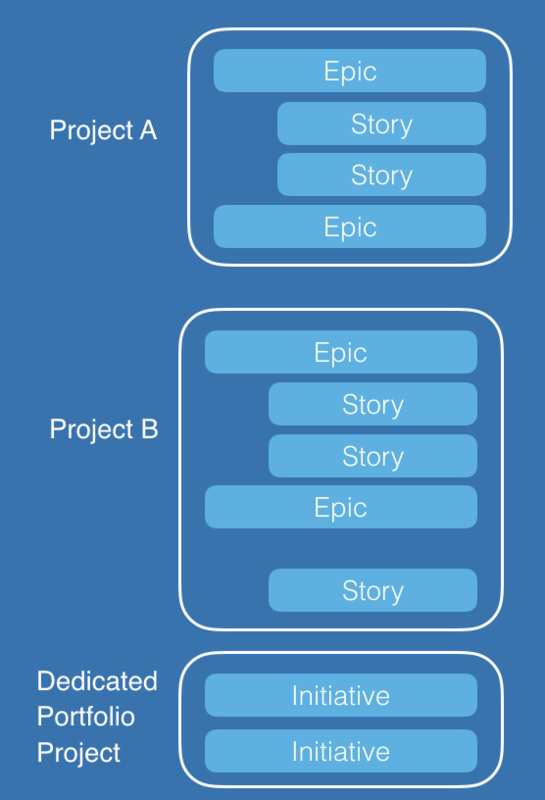 Stories are the units for work being done in Jira, and your team typically estimates the effort needed to complete these stories. Sub-tasks – Sub-tasks are smaller chunks of work that need to be completed, to complete a story. Initiative, on the other hand, is not included in the default hierarchy level. However, initiatives are essential when working with Portfolio for Jira. Typically configured at a higher level than epics, initiatives are the high-level priorities that multiple teams or departments work against in an organization or company. Initiatives can span multiple epics, projects, and teams, and the work for initiatives can last months and even years. As both Portfolio for Jira and Jira are highly customizable, you can also customize hierarchy levels to fit the needs of your team. 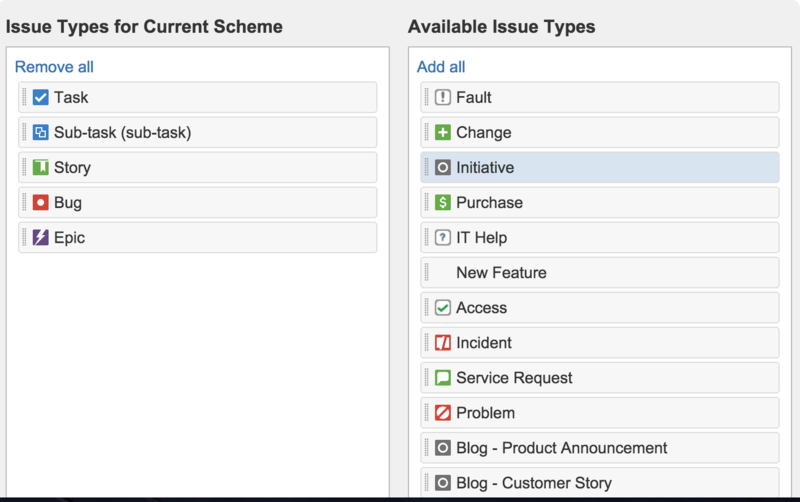 You can also define the relationship between the issue types in Jira and the hierarchy levels in Portfolio for Jira. You can create unlimited hierarchy levels, and customize the names for the levels as necessary. Note that any changes you make to the hierarchy levels in Portfolio for Jira will apply to all existing Portfolio plans. Go to Portfolio (in header) > Administration > Portfolio Hierarchy Configuration. Enter a name for the level, and then map the new level to a Jira issue type. You can remove a level by clicking Remove correspondingly. You can't remove epics, stories, and sub-tasks, since these comprise the default hierarchy level in Portfolio for Jira. Similarly, you can't rearrange epics, stories, and sub-tasks, as these are part of the default hierarchy level. You can rearrange other custom levels by drag-and-drop, as needed. An issue can live in a single Jira project. However, if your organization is working on several projects, you might want to consider having your initiative to span multiple projects. If you're working with cross-project initiatives, you can create a dedicated Jira project, where the cross-project initiatives are stored, and then use the project as an issue source in your plan. Create a Jira project that will hold your initiatives. Go to your Jira application > > Issues. Create a new issue type called Initiative, and set it as Standard Issue Type, and then click Add. Click Issue type schemes > find your project > click Edit. Drag and drop the initiative issue type to the issue types for your project. Click more ( ) next to the plan name > Configure > Issue sources. Select your new project as an issue source. Click + Create Level and create the new initiative level. Click Apply > Save changes. If you need more hierarchy levels in your project, and your initiatives don't span multiple projects, then you can choose to add the initiative level to just your project. You can use this approach in cases where you need more hierarchy levels within your project, and when your initiatives will rarely be cross-project. If your team doesn't want to see the initiatives in your Jira board, you can configure the board filter to exclude initiatives from the board. You can then create a new filter that only includes the initiatives, and then add that as an extra source to your plan. Connect your plan to both the project holding your initiatives, as well as the other projects or boards containing epics and stories. Multiple issue types can be mapped into each hierarchy level. You can map Jira stories, bugs, and tasks into custom Portfolio for Jira levels. Keep in mind that the following configuration will be applied to all plans. Before mapping a Jira issue type into Portfolio, make sure that the issue type has been created in your Jira application instance. You can learn more about creating issue types here. Once you've created your new issue type in your Jira application, it's time to map it into Portfolio for Jira. Choose the issue types you want to configure from the drop-down menu, then map them into to the hierarchy level you want, and then click Apply. Now you can work with the new hierarchy levels in the scope view of your plans.